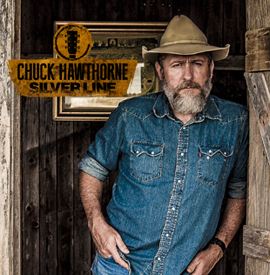 To look at him on the cover of his debut album you’d never imagine that Chuck Hawthorne spent 21 years in the Military; mostly in the Marines. But perhaps, it has taken those life experiences to create this set of really intelligent, introspective and often philosophical songs that would do justice to Willie in his earlier days or perhaps Don Williams. The title track opens the album and captures the spirit of old-style Country music in every line and note as the world weary singer looks back on his life with a wry smile on his lips. Ray Bonneville’s pillow soft production brings out the very best in Hawthorne’s voice and well told stories of small town middle America; some from his own experiences and others from friends reminisces; but the important thing is Hawthorne’s rich interpretations and economical delivery. Classic Country styling weaves its way through every song here; none more so than Ovando with the windswept fiddle and simple drum patterns in the background. Two of my favourite singers get to make cameo appearances; Gurf Morlix adds his weight to several songs and Eliza Gilkyson manages to sound ethereal on Leaving Amarillo. It’s no surprise that most songs here have a certain darkness to them; and the ‘stand out track’ Post 2 Gate is the darkest of them all; written in basement of a Baghdad Palace Hawthorne tells the tale of a suicide bomber from everyone’s point of view; including the soldier’s wife waiting at home. I don’t think there will be many Gung-Ho Imperialistic warmongers among the people reading this; but if there are – listen to this song within the hour. Chuck Hawthorne is a rare find; an amazing songwriter with a wonderful voice; but I can’t end without mentioning his well -honed guitar picking on the blue-collar Welding Son of a Gun, and the mournful harmonica playing on Enemy too.